Luke Moore (IT Blanchardstown) and Tan Wee Ling (IT Carlow) take 3rd Level Men’s and Women’s Open Singles. 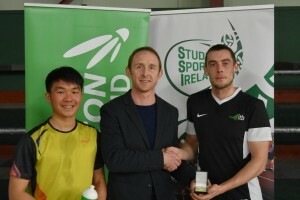 Last Thursday Baldoyle Badminton Centre was the venue for the Student Sport Ireland / Badminton Ireland Men’s and Women’s Open Singles 3rd Level competitions with over 20 of the top 3rd Level players competing. Luke Moore took the Men’s title with a faultless performance again Wee Lun Foo from Athlone IT, as the IT Blanchardstown man took the final on a 21-10, 21-8 score line. 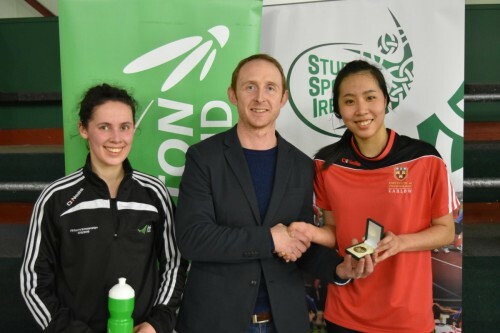 Luke Moore’s IT Blanchardstown team mate and mixed doubles partner Megan Bredin played her part in what was a superb Women’s Open final, as Tan Wee Ling from IT Carlow won a three-set encounter on a 21-18, 14-21, 21-10 score line. The tournament was set up to in a round robin format with 13 players in the Men’s Open Singles with the winner of each group going through the semi-finals with the second placed team in each group qualifying for the plate semi-finals. Jack Lawlor (IT Tallaght), Luke Moore (IT Blanchardstown), Wee Lun Foo (Athlone IT) all progressed from their groups without dropping a set, however group four proved to be the group of death with Jack Davies (Letterkenny IT), Paddy Martin (IT Tallaght) and Brendan McGovern (IT Tralee) all paired together. McGovern pushed his two opponents all the way but eventually it was a winner take all showdown between Davies and Martin with the Letterkenny IT player just about getting the win to secure the remaining semi-final spot. Jack Lawlor took on Luke Moore in the first semi-final and was left to rue a missed opportunity in the opening set as he failed to close out a 19-18 lead before losing the opener 21-19, the second game followed the point for point battle in scores before Moore showed his big game experience to win 21-19. Wee Lun Foo who previously represented Dundalk IT earned a final spot for Athlone IT with a superb performance to see off Jack Davies from Letterkenny. In what was a highly motivated game Foo kept his nerve and took victory on a 16-21, 21-19, 21-19 score. Foo was unable to repeat that showing in the final as Moore stepped up the gears and dominated on a 21-9, 21-10 score line. The Men’s plate saw Justin Deligney and Paddy Martin meet in an all IT Tallaght final after securing wins over Matthew Soh (Griffith College Dublin) and Aaron Tan (IT Tralee) respectively. Both players were well used to each other styles and eventually it was Deligney who prevailed after a fine game on a 21-14, 21-17 score line. The Women’s Open singles was a single group of six players with eventual finalists Tan Wee Ling and Megan Bredin accounting for all before them in the group stages with victories over Cheuk Wing (Ulster University), Aoife Boylan (IT Tallaght), Alisha Burke (Letterkenny IT) and Aileen Pfuffe (IT Carlow) with the IT Carlow student just missing out on a final spot. The women’s final did not fail to deliver as perennial winner on the third level scene Bredin would see her winning run come to an end with IT Carlow’s Ling winning 21-18, 14-21, 21-10. There is one final competition on the 3rd level calendar for completion on March 6th in Baldoyle as the SSI/Badminton Ireland Team of five finals take place, with the top eight teams in the country coming together at the quarter final stages and will play to a winner on the day.